Automotive Forums .com Car Chat > Car Rumors & Concepts > OHHH. That '04 NSX sure looks good. OHHH. That '04 NSX sure looks good. In the September Road and Track I got today, I was immediately in love w/ the possible Acura NSX for 04 drawing. I WANT ONE NOW! but the 02/03 doesn't look that great (a couple pages before the 04), the that 04 puts it way above my favorite affordable car, the RSX. I might have to extend my 'page in the works' to include the 04 NSX too. you guys like it too? if anyone has a scanner can you plz post the image from the cover of the september Road and Track? I don't have pics but I saw R/T is that the Blue one? If so I think it got the facelift it needed. It was yellow in the pic. There was also a blue one (with a bigger spoiler and fixed headlights) that is supposed to simply provide some sort of change before the next one comes out. I thought that one was ugly. Anyhow, the new one looks good, and I'm excited that it will have a V8, but I like the current one more....just like I like the current Elise and the first miata. hmm.. although i like both miata's and elise's, the newer versions are my favorite. Same with the new NSX. I always like it, but I always thought the design was outdated. Exposed headlights are what it needs. The facelift (blue) isn't that beautiful, but the complete redesign (yellow) coming up is. Here is the pics Adam was talking about. The front is probaly correct since it has been shown like that for a long time. The rear looks weird. I don't think Honda will put that big of a brake light in. I don't like it. I don't buy it. I don't believe it. I refuse to believe it until I see it. :mad: BOOOOO!!! The blue one looks gay - the yellow one though... Wow! Looks like the Lamborghini owned Italdesign Cala. exactly. headlights are extremely important to how a car looks, at least in my opinion they do. True, the headlights may need some working to keep them original, but as long as they retain that triangular look, they'll keep that gorgeous shape. Overall, thats one beautiful car :). i agree about the blue one... but the yellow one looks nice! don't you think? i agree about the blue one... but the yellow one looks nice! don't you think? No, I'm afraid not. 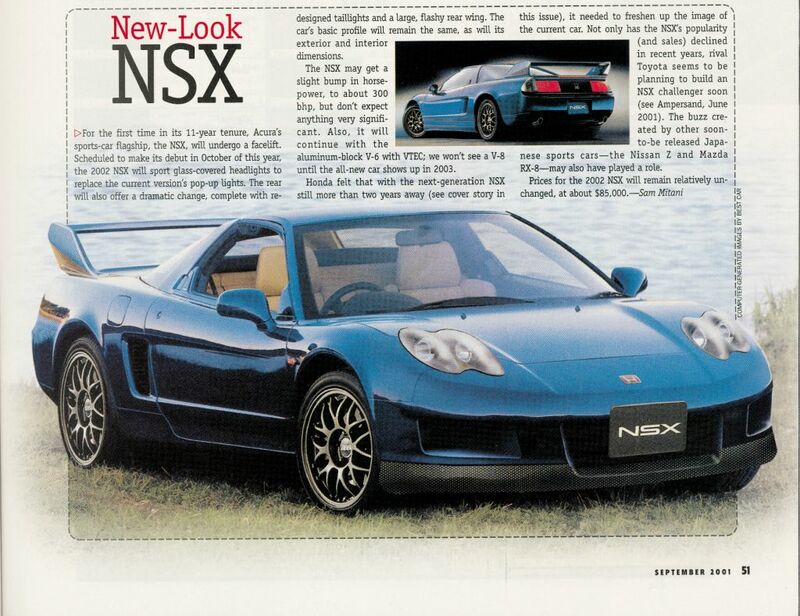 :mad: Like I've said before, I hope Honda blows us away with the next NSX. I hope it's far from these "concepts." 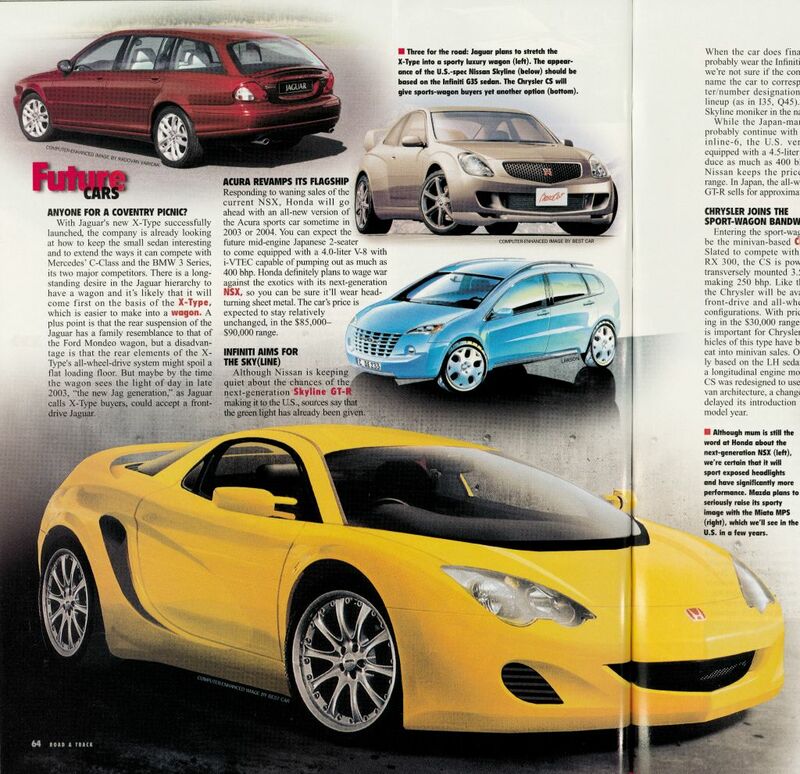 various magazines have shown similar renderings as the blue one. I think that the blue one is pretty ACURrAte, except for the rear wing and rear lights. the blue one's headlights are great i think. pretty unique actually. i like 'em alot. headlights are what a car is all about and those two drawings have fast, pulled back, and exposed headlights. blue one: :) :( gorgeus front, rear needs revision.... what was that artist thinking! I think I better step in and clear up things. There is 2 NSX in the next 3 years. One is a face-lift version. One is a totally re-design version. Face-lift version uses current generation materials. It differs because of a stationary headlight instead of pop-up. The rear also have been modify as well. Rumors were a Type R version finishing off the model life. The blue one is just an photoshoped picture of the face-lift version. This version arrives for 2002. Re-design version is going to be a new generation. There is a couple engine choices been dicuss so far. 3.5L V6 with i-VTEC tuned to pump out 395hp. 3.8L V6 with i-VTEC tuned to pump out 415hp. 4.0L V8 i-VTEC (mugen developed) tuned to pump out 400hp. There is also a possiblilty of IMA. Honda has said clearly it will not play catch up game. It will be out there to set the standards. So expect a lot of technology into the next NSX. The yellow one you see is artist drawing of possible next generation NSX. I have seen many variation of that picture. Some of them have been used by magazine in connection with Toyota's own supercar 4000/4500/5000GT. The expected arrival date is 2004 or 2005 for this new generation NSX. The blue one supposed to be the facelifted one? their totally of mark with the impression, so why should i believe the yellow one will be the next NSX? I'm not real crazy about the facelift... just leave the darn car alone, Honda! The stationary headlights are a big no-no to me. Not just because I like them, but because they're an integral part of the NSX. One of the nice things about this car is, it's expensive. Prohibitively so for most people, so obviously Honda is not interested in compromising it much for the sake of sales. Pop-up headlights on a modern performance car say, "Kiss my moderately unsanitary posterior, aerodynamics. I'm far too important to worry about you little laws of physics." I'm disappointed with the change. It seems Honda wants to compete with the Italian supercars, based on the new NSX's styling. A V8? Wow. 400 horses? Geez. Hey, you know what the NSX is going to be competing against??? The next GT-R!!! And thus, a $90k, 400 hp V8 Lambo-wannabe is going to get pimp-slapped by a much cheaper (I think... I hope), 450+ hp twin-turbo V6. I don't care if the Italians like it N/A, Honda should take a hint from Nissan, Subaru, and Mitsubishi and TURBOCHARGE IT! Subaru has already realized that importing their turbo cars is a good idea, and I'm sure the x000GT will have some kind of forced induction (at least at the highest trim level). Remember, the NSX is a fairly expensive car. People will not buy it for cosmetics alone... well, not many people. A few ricers will sell their internal organs for that yellow one with the RSX headlights, I'm sure. But Honda needs to get on the ball and not wait for Dinan and Comptech to beef up the NSX this time around. Boy, I just went off. I feel like I need to put a disclaimer somewhere. I am not a huge fan of Honda, I think the NSX is nice but over priced. In Australia and NSX is $250000. The Yellow pic is sensational, I would not pay more than $US30000 for it, and the only drawback the the blue NSX above it, is it is not a Spyder, it would look great as a ragtop convertible, as the S2000 is ugly. like the blue one more but they are both good. The next NSX is going to have a V8 thats all that i know.